Trees Matter... and they're tasty! Trees provide many functions and benefits. The Urban Food Forest program is devoted to demonstrating the important function of community engagement that trees provide by showing how different trees can be harvested, processed, and prepared as a means of food. Events in the series are designed as a community building program with opportunities to attend potlucks, happy hours, workshops, go on harvesting events, and volunteer to help educate the public on the free food that trees provide. Events occur quarterly and at varying locations throughout the Valley. 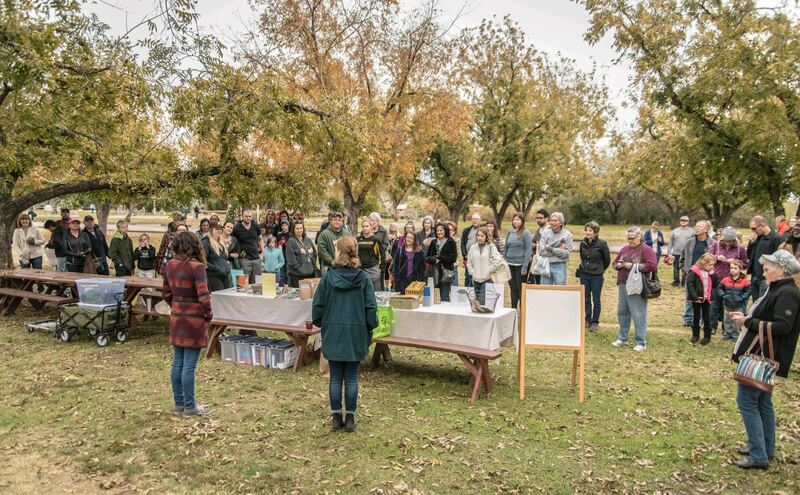 led by Trees Matter & Mesa Urban Garden | Jan. 27, 2018 | View photos here. led by Trees Matter & The Farm | Dec. 16, 2017 | View photos here. led by Trees Matter & sponsors | Oct. 28, 2017 | View photos here. led by Peggy Sorensen | June 14, 2017 | View photos here. led by Kelly Athena | April 12, 2017 | View photos here. led by John Slattery | Feb. 18, 2017 | View photos here. Take a look at our calendar below to view upcoming Urban Food Forest Events!